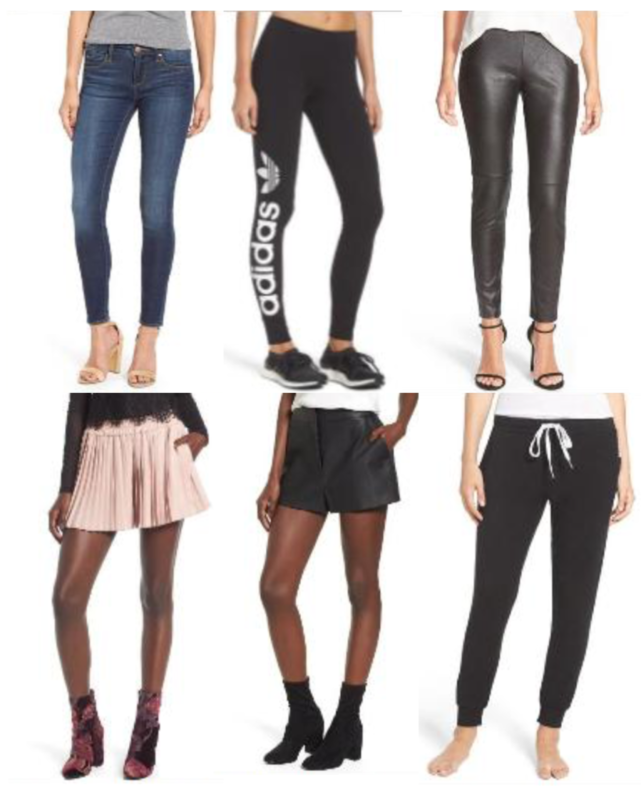 The Nordstrom Anniversary Sale is now officially on for those with early access! There are so many amazing brands this year that are marked down! I found some killer deals in Apparel, Shoes, Handbags and Accessories, Jewelry, Beauty, and Kids. I’m going to start by sharing some of the clothes, shoes and accessories I got (or want) for myself, and then I’ll tackle the beauty and kids items later this week! 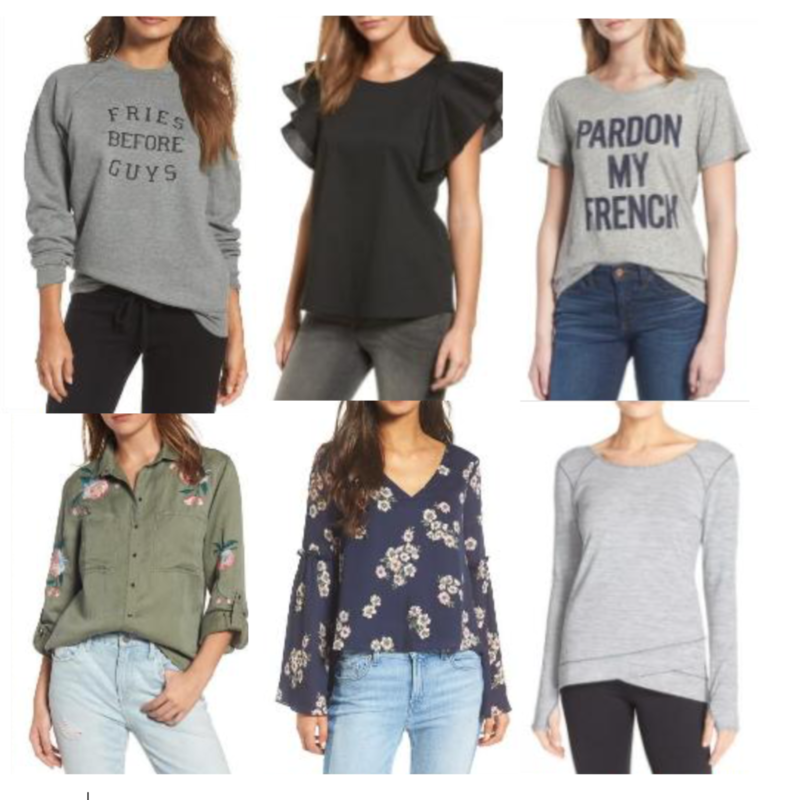 Here’s some of my favorite tops I found at my local Nordstrom yesterday! I LOVE this sweater (comes in red too). It reminds me so much of a free people sweater I got last year, but this one is about a third of the price right now! It has a baggier/oversized fit (I’m wearing a small). I loved this striped tee too! It’s super light-weight, but not see-through. It’s less than $20 right now! Another great, basic top. This one runs a little small in my opinion! I’m wearing a medium because I wanted a baggier look. My FAVORITE plaid shirt from the sale! I get SO much use out of plaid shirts. I wear them with shorts in the Summer, jeans in the Fall, and then I layer them with vests and jackets in the Winter. This one definitely has an oversized/baggy fit. This is an xtra small! Another great plaid top! This one is long enough to wear with leggings, or tucked into jeans. And one more plaid shirt. I LOVED the sleeve detail on this pretty top. I’m wearing it to a brunch I’m attending this morning! OBSESSED with this sweater! It’s so so soft! It also has a baggy/oversized fit and is long enough to wear with leggings. This tee has the BEST FIT! I can’t believe it was only $15! I got one in white, pink and gray. I loved this sweater too! Usually this brand runs big but this one is more cropped and fitted. I’m wearing a small here but I ended up buying a Medium because I wanted it baggier. So if you’re between sizes go up. Loving the sleeves on this one. I got two cardigans at the sale. The one I’m wearing is this one. And this I also snagged this guy. They are both so so so soft! Literally like being wrapped up in the softest blanket! I can’t wait to wear them when I’m traveling. Loved this basic. You could dress it up with jeans or down with leggings and sneakers. I saw this one in the preview catalog and it was one of the ones I was most excited about trying on, but I didn’t end up getting it. The fit was not right for me (I think it would be better on a shorter person?). This is another one I liked on the hanger but it didn’t fit me right. Again, I think my torso was too long for it. This is another one I put back, but when Kent saw this picture tonight he was like, “Oh I love that.” Sooooo maybe I’ll go back and get it. These are some of my favorite bottoms that they didn’t have in my store so I’ll be ordering these online! Except for the jeans! They did have these at my Nordstrom and I loved them! I’m wearing them in all of the pictures above. They are very stretchy and comfortable and I can’t believe they’re under $40 right now! I’m planning to get another higher end pair of denim as well, I just ran out of time today so I’ll have to go back for them. Everything else I’ll review when it comes in on my Instastory. 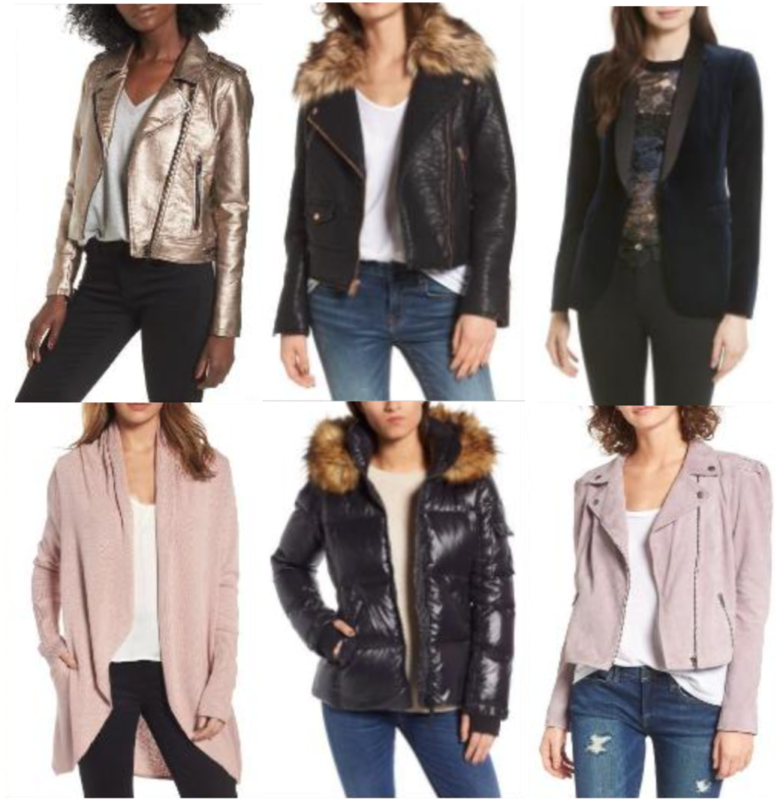 How cute is all this Outerwear?! I can’t wait to wear this metallic leather jacket and velvet blazer when I go to New York in September! And that bomber looks perfect for a snowy day! These tops weren’t available in my store so I had to order them online as well. 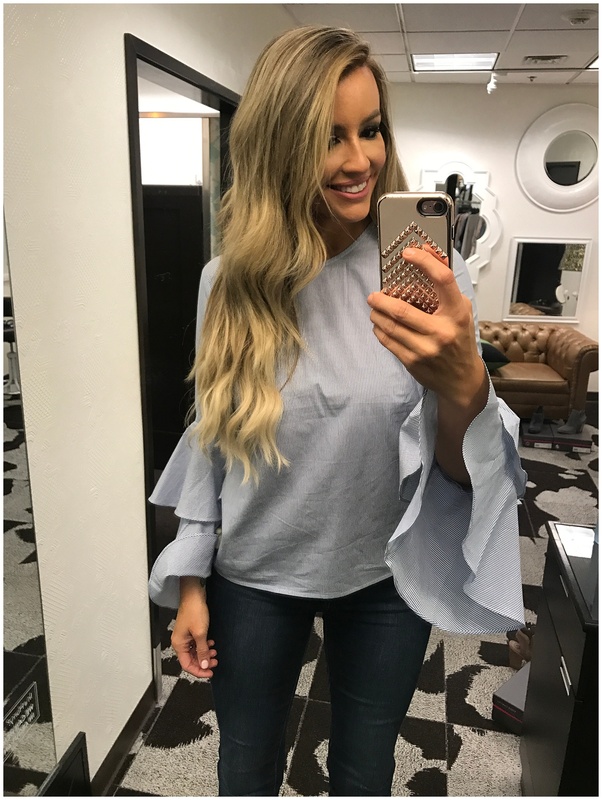 Ruffle Top – Love these sleeves! It comes in white too! Embroidered Top – One of my favorites in the catalog! I hope I love it as much in real life! Floral Top – I think this is so pretty. Workout basic – I can’t resist thumb holes. These Hunters I already have and LOVE! If you don’t have a pair, snag them while they’re on sale (they’re never on sale)! My store had these taupe booties in the store and they’re PERFECTION! I definitely think these will sell out so grab them asap! Loved these Gray Booties too. How cute are these earrings for the holidays?! – and, I feel like these Earrings will go with everything (You guys know I’ve been on a rose gold kick lately)! I’ve been wanting some Sunglasses in this shape! I also grabbed this little black dress and this one for a couple of events we have this year. I’ll be posting more updates on these items as they arrive! I’m planning to do a “try-on” session on my Instastory next week when I get everything! Love it all! Thanks for the honest review and super late night post! Yay! Glad you liked it! Hope you find some good stuff too! so cute, love your photos and all these sale items.